Barrow only uses his vengeful skill set for good these days, not evil. And in tonight’s episode, we see Barrow take up Lady Mary’s invitation to bring down Sinderby’s butler, and then go one step farther, raiding Sinderby’s own closet for the perfect skeleton that could completely undo him—and manages to find it, or “him” specifically: the illegitimate son he sired with another woman. Barrow lures both to Hogwarts during a party, but Rose thwarts his plan and saves the unsavory Sinderby. Why exactly? I suppose to forge a good relationship with her father-in-law on the foundation of his extramarital sins. But we would have loved to see how the episode would have played out Sliding Doors-style had Sinderby’s illegitimate son been discovered. Who is this new and improved Lord Grantham, who not only detects emotional nuance but is able to appropriately reciprocate it? Last week, we watched as Lord Grantham surprised everyone by going out of his way to do something thoughtful for Mrs. Patmore. And now, when he decides to tell Edith he’s learned of her secret, he does so with sympathy and understanding. “I’m sure I need your forgiveness just as much as you need mine,” he tells Edith after she apologizes. The line is so Oprah-level spot-on, that we half expected Lord Grantham to suddenly rip his face off, Mission Impossible mask-style, revealing that Dr. Phil had been there underneath the whole time. It will be interesting to see how Mary reacts to the news that her sister is Marigold’s mother, and see whether this news will finally soften their relationship as cartoonish enemies. In what was surely the worst moment of the episode, Branson stares off in the children’s nursery and, when Edith asks why, he says because he “is taking pictures in his mind” so that he has memories of the home when he is in Boston. Later, he tops himself for stiff line readings when he tells Lord Grantham that he will not consider leaving Sybbie at Downton but adds this as some weird consolation: “I love the way you love her.” Farewell, Tom. Well what else should she do during the course of the episode? Break Anna out of prison? Mother her child? Forge a relationship with her last living sister? Ha! No, Mary played etiquette police on tonight’s episode, informing Henry Talbot (Matthew Goode) that he had rudely (if unknowingly) crashed their hunting party. Of course, Mary can segue any awkward introduction with a handsome man into a flirtation, and manages to do just that, showing us that she has better chemistry with him and his fancy car than she had with either Blake or Gillingham. May we never forget that this was actually a storyline in tonight’s Downton Abbey. Spratt nurtures his inner Barrow this episode, suggesting that Denka prove herself as a lady’s maid by making broth. Alas, the challenge only unites Denka and the Dowager and wastes valuable screen time that could have been spent on the surprisingly crafty Molesley. Yes, the same man that dyed his hair shoe-polish black earlier this season finds a way to free Bates from his self-imposed Fugitive sentence. (Where were these two back when Bates was wrongly accused of murder the first time around?) While the rest of the house wrings their hands over the criminal drama-prone character—who foolishly confessed to a murder he did not commit to free Anna, and then ran away Dr. Richard Kimble-style—Molesley finds a photo of Bates and then recruits Baxter to travel to each and every pub in York until he finds a witness who can confirm Bates’s alibi. And it is a good thing too: I don’t know that any of us were as invested in this plot retread to purchase “Free Bates” T-shirts this time around. 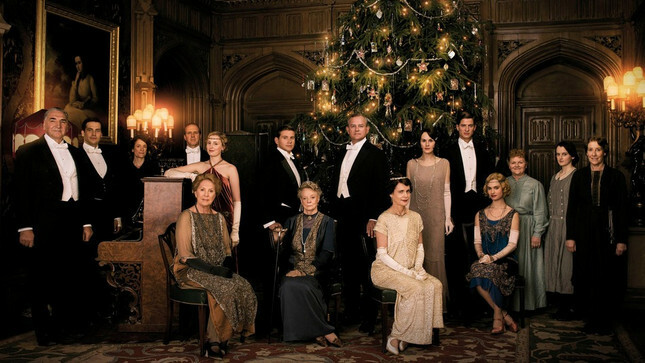 The episode ends with Bates sneaking into Downton Abbey on Christmas Eve and surprising Anna, which is nice for them. But of all the characters on the series, these two need a plot makeover most. Maybe next Christmas. Julie Miller is a Hollywood writer for Vanity Fair‘s website.